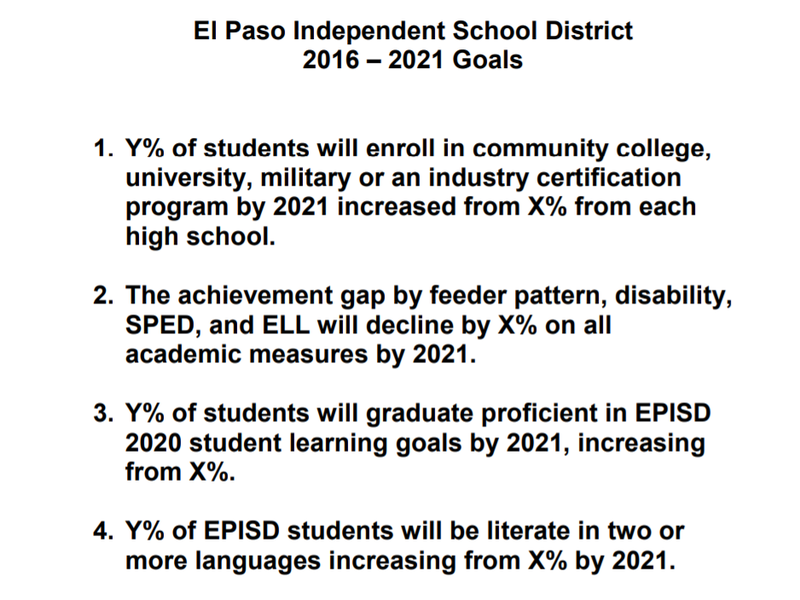 EPISD’s goals are to get better in a few years. Most of us would set shorter term intermediate goals in order to make progress every year. This entry was posted on Wednesday, August 23rd, 2017 at 4:08 AM and is filed under El Paso Independent School District. You can follow any responses to this entry through the RSS 2.0 feed. You can leave a response, or trackback from your own site. One does not have to be grumpy, old, male, or farty to understand what is continuing to happen here. Setting such long term goals in an organization that makes huge changes to programs and personnel quarterly (and even monthly sometimes) is a farce of the first order. These projections are merely there so that when these “leaders” leave for their next highly paid educational job, they can smile at their future victims and say, “Look at all the great stuff we did for EPISD!” And, since none of these goals will have been reached by the time this happens, there is no way to dispute their claims to having actually done ANYTHING of substance during their time here. They made plans. They had meetings (oh Lord do they have meetings!). They shuffled the administrative flow chart boxes around. Oh, and they spent pornographically obscene amounts of money on useless programs and loads of tech that will not improve education one tiny bit. None of these goals will be realized. None of them will come even close. And NO ONE will remember they said any of this! Now, having said all this in a lame (yet somehow effective) attempt to convince the public they are actually interested in the performance of their students, they are free to get back to their actual work of trying to “change the face of education in America”. This great experiment stars your children and grandchildren (for the “old” members of the group) as the test subjects. The white mice, if you will. To be tested, used, or destroyed at need. The future these children will have has no meaning to any of them; just as how the current lives of their own employees mean nothing to them. Only following the current political narrative sparks a fire in their hearts. Hmmm. I guess that shut this one down. So until 2021 THEY will continue to increase taxes, bleed the taxpayers to fund EPISD and the Cabrera Empire, with MILLIONS, BILLIONS more $$$$$ flushed down the EPISD Cartel toilet. Yes. And those hand picked replacements of theirs will continue the tax payer funded slime trail further into the future. Timoteo, please explain why this is the perfect way to plan student outcomes … and why us cranky, old farts just sit here in our ignorant, white privilege. All you other old farts like me need to remember, by 2021, a lot of us will not be here to remember their miraculous manipulations from 2017. Not sure where Brutus got that from so I can’t comment on it. John, and yes they just hired the “Branding” or Marketing company again at a cost of $300,000 paid with local funds to make sure the public does not find out what is really happening. What?! EPISD speed spending tax payer’s hard earned money on something completely useless to the education of our children? Can you imagine our surprise? Perhaps there is a yearly goal that is not published. Those goals are just so much fluff. The same crap was created for YISD some years ago, and none of it really means anything. Instead of focusing on teaching kids to be ready for the work force, instead of encouraging the pursuit of skills that might actually be helpful in life, they come up with these high falutin’ BS smoke and mirror slogans for PR.